Ash Brannon co-writes and directs this animated adventure based on Zheng Jun's graphic novel. When a package containing a small radio falls from a passing plane into the village of Snow Mountain, young Tibetan Mastiff Bodi (voice of Luke Wilson) begins listening to his favourite rock music. 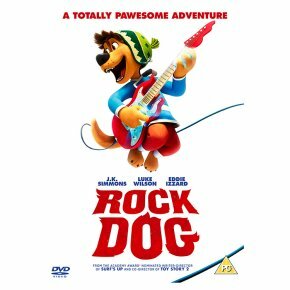 With his father Khampa (J.K. Simmons) desperately trying to train him to be able to protect the village from a pack of grey wolves led by the evil Linnux (Lewis Black), Bodi soon becomes distracted and decides to ditch his guard duties and head to the city in an attempt to become a famous rock star. However, after seeking out his favourite guitarist Angus Scattergood (Eddie Izzard), Linnux's henchmen discover Bodi's whereabouts and kidnap him as part of a plan to take over Snow Mountain. With his new buddy in serious danger, it's now up to Angus to try and save the day.